Zombies have invaded Christmas! Did you really think the holidays were safe? Zombies are everywhere, and now you can zombify your Christmas, or any other event or holiday too, just by hanging and displaying your very own Zombie Christmas Ornament Set! This impressive set consists of a quarter of symbols that are near and dear to the heart of any zombie setting, giving you a fairly even spread of styles to show off when you want to deck the halls in true zombie apocalypse style. Each set includes four ornaments, each of which is quite distinctive in its look. You get a trio of silver bullets (which cannot be separated) that are perfect for any celebrating zombie hunter. You get a gold biohazard sign, to help ward off other survivors and warn them of impending infection in the area. You get a green zombie brain, which is sure to attract fellow zombies to your festive holiday celebrations. And lastly, you get a vibrant red splash of blood, just like survivors and zombies alike are sure to see, wherever they go! Each ornament is impressively detailed and crafted from quality stiffened 3/4 oz. leather, which gives them just the right level of flex and stiffness. They are hand-painted too, to ensure the utmost detail possible. While the shapes, and therefore the sizes, can vary somewhat, each ornament measures approximately 3 inches in its greatest dimension. Please note that they do not include hanging hooks. Also, each ornament is one sided, and due to the process used to shape them, the back side may feature slight scorch marks. These items are totally unique and exclusive to our shop, as well as having been hand crafted right here in the USA. Want to zombify your holiday season? 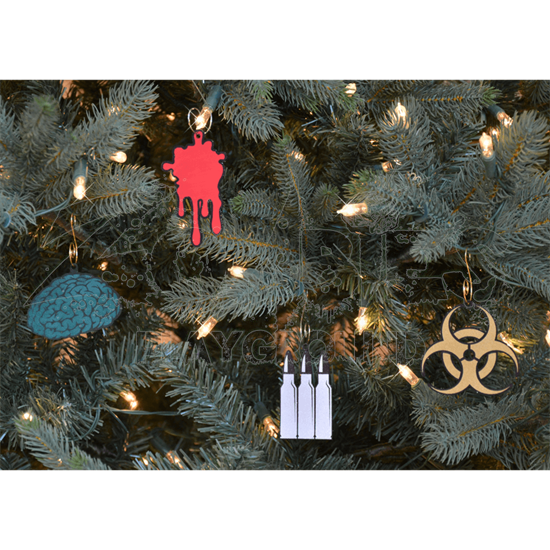 Pick up a Zombie Christmas Ornament Set today (or two or three or more), and you will have almost all you need to get started on your very own very merry zombie x-mas!